Lovely second floor one bed apartment, located in the heart of the Old Town and close to Greyfriars Churchyard. Free wifi. The apartment is let on holiday lets for only a short period every year and recently mainly on repeat custom. We've also recently undergone a refurbishment. There are beautiful wooden floors throughout the apartment. The building itself is of architectural significance (Grade B listed) and of historical importance, dating from 1739 and originally the Edinburgh Charity Workhouse. The living room has a dining area and traditional fire place with electric fire. The modern kitchen area is well equipped with crockery, cutlery, glasses and kitchenware, as well as a washing machine, fridge-freezer, cooker and microwave. The double bedroom has a wardrobe and chest of drawers. The bathroom is tiled (recently re-tiled) and has a wash-hand basin, toilet and bathtub with shower over. Gas, electricity, linen and cleaning are included. For the comfort of future guests, the apartment is non-smoking and pets are not allowed. There is so much to do in Edinburgh! Have a look at the official Edinburgh visitors website ( Edinburgh has an astonishing array of tales to tell from its dark and gory past. There are plenty of guided tours that will help you learn more. 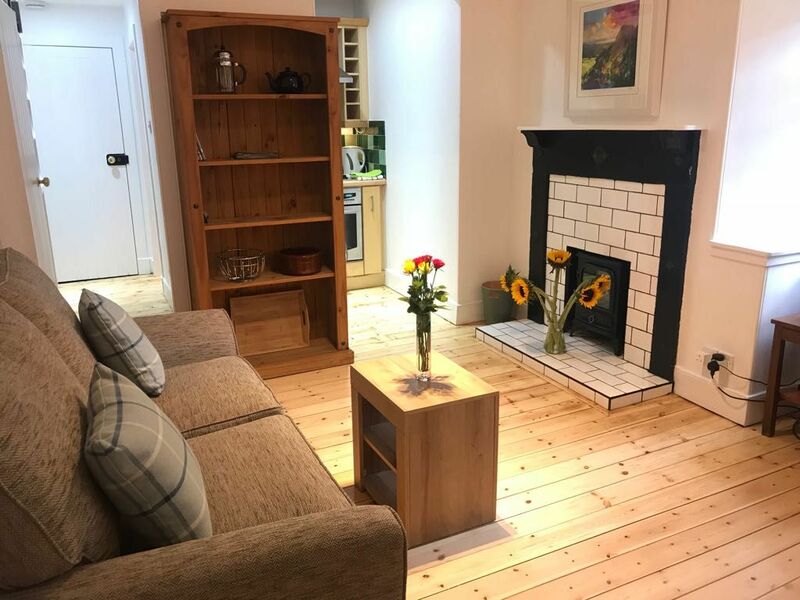 The apartment is very close to the attractive Grassmarket, with its many shops and restaurants (head down Candlemaker Row by Greyfriars Churchyard). Just off the Grassmarket, and leading back to the Royal Mile, is Victoria Street (or the 'West Bow'). Check out Maison Bleu for great food! Just around the corner from the apartment is Greyfriars Church (built in 1620) and churchyard. At the entrance you will find a memorial to Greyfriars Bobby, the faithful Skye terrier, who, so devoted was he to his master, that he sat on his master's grave for 14 years until he died in 1872. Across the road from the Greyfriars Bobby memorial is the National Museum of Scotland (Chambers Street), recently refubished and holding international collections of decorative arts, science, industry, archeaology and the natural world. Next door you can enjoy fine dining at the splendid Tower Restaurant on the top floor of the Museum of Scotland, which has terraces with amazing views over the city. The apartment is close to the University of Edinburgh main campus (established in 1582), with its many landmark buildings. Next to the University lie the Meadows, a large area of open parkland in the heart of the city. Near the top of the Meadows path (close to the apartment) you will find a small Sainsbury's supermarket. Starbucks is next to Sainsbury's. For some serious nightlife, the Cowgate (centre of the city’s nightlife) is close by. We are happy to provide any further information to help you with your stay, so please do ask! Wall heater in bedroom and electric fireplace in the living room. We have a cafetière and tea pot. There are two chairs as standard and two extra chairs available (behind the hall door). There are lots of books to suit all tastes, and several with a Scottish theme. The apartment is most suitable for up to 2 adults and 2 children or 3 adults. The sofa bed is a double but it is a small double. There is free wifi in the apartment. We also have a spare router, just in case. We spent a few nights here while exploring Edinburgh and it definitely exceeded expectations. We wanted to stay someplace that was walkable to everything we wanted to see and this apartment certainly was. Just around the corner from a fairly famous pub, this is pretty much an equal distance from Edinburgh Castle and Palace of Holyroodhouse, but just off the Royal Mile, so tucked away from all the tourist traffic. You'll get a bit of street noise, but not much and given the location that's pretty much par for the course. You either have convenience or total quiet-it's not possible to have both if you're staying near the Royal Mile. The apartment was clean, well decorated and spacious for two people, with a comfortable bed, well appointed kitchen and a good washer/dryer. It also has a nice selection of Scottish based books and movies and Jennifer welcomed us with wine and shortbread, a great touch. Communication with Jennifer was easy and she was always quick to respond. She was wonderful regarding check in and was very flexible, which worked great for us as our travel plans day to day weren't set in stone. This apartment felt like a home away from home for us and the location can't be beat. So happy we found it! I gave this apartment five stars because our overall experience was great. From my first contact with the owner, she was always very prompt and helpful in her replies, even about little things such as where the nearest grocery store was, etc. the apartment building itself is a beautiful old building, but it is obvious that this apartment was recently renovated and is kept in very nice condition. It is definitely on the cozy end size-wise, but still very comfortable for two adults. The kitchen is fully stocked with cooking equipment (much more than we needed), and easy to use. The washer and dryer is a single machine that took some getting used to for those of us that have never used one before, but the instruction manual provided some help. When I first booked this apartment, my daughter wasn't walking yet, but by the time our visit arrived she was cruising consistently and wanting to walk constantly. This apartment was a little cramped for that purpose, but not such a big deal in the end because we spent most of every day sightseeing, and also let her stretch her legs in the Greyfriars abbey yard right next door. Also along the lines of child issues, We were also grateful for the numerous restaurants along this street, many of which offered take out, which is sometimes key with a tired toddler at 7pm. Also, the one night we did eat out with her, we went to an Italian restaurant (Vittorio) which was just a block away. Their window said "children very welcome" and I have to say that was very true. Practically every waiter in the restaurant cooed and flirted with our daughter and kept her entertained, while they also were careful to keep our dinner moving quickly. Overall, we had a great time in Edinburgh with this apartment being home base. Would definitely return again or recommend to family or friends. Our cosy apartment is centrally located in Edinburgh's Old Town, overlooking Greyfriars Bobby and the National Museum of Scotland. The grandeur of the Royal Mile and Edinburgh Castle is just a few minutes walk away and Princes Street, with the famous Scott Monument and the picturesque New Town also just a short walk away. Although we are moments from the Royal Mile, we are also close to other excellent restaurants and attractions. The gorgeous bar and restaurant at the Hotel Du Vin is directly opposite Forrest Hill, and the brilliant (and reasonable) Outsider Restaurant is on George IV Bridge, just off Forrest Road. On Forrest Road you will find an excellent and authentic Indian restaurant (Namaste) and an array of other snacking opportunities. For a very special experience, you can head back to the Castle entrance and dine at the Witchery. To get to Princes Street from the apartment, all you need to do is head past the Royal Mile to the top of Market Street (off The Mound) and then down the steps towards the Scottish National Gallery and to Princes Street. Alternatively, try walking down one of the many wynds and closes (narrow alleyways) off the Royal Mile - for example Advocates Close or Fleshmarket Close. Waverley Station, being Edinburgh's central railway station, is only about 10 minutes from the apartment on foot. It is an uphill journey from Waverley to the Old Town though, so do bear that in mind if you arrive with a lot of luggage. There are plenty of buses, taxis and cycle rickshaws nearby if you need them. Waverley Bridge, just outside the station, is also a good place to catch a bus to the airport. You can also hire a car at Waverley Station (Europcar or Enterprise) and, by prior arrangement, return it at the airport. Taxis to and from the airport from the apartment cost in the region of £17 - £20. Nearby attractions abound. Don't forget to visit Edinburgh Castle and the many other buildings of architectural significance on the Royal Mile such as St. Gile's Cathedral and the ancient Scottish Parliament Building, Mary King's Close (involving an atmospheric tour of Edinburgh's Old Town tenements), the splendid and revamped National Museum of Scotland and Greyfriars Churchyard (next to our apartment building and accessed at the top of Candlemaker Row). The Edinburgh Festival takes place in August. We couldn't really be closer to some of the most popular Edinburgh Festival (Fringe) attractions, such as the Gilded Balloon and Pleasance Dome. The prices include all local taxes, cleaning and linen charges. A deposit of £100 is required to secure bookings of £400 or less. For bookings over £400, the deposit is 25%. The balance is due 4 weeks prior to the booking.